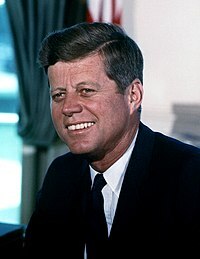 The presidency of John F. Kennedy began on January 20, 1961, when John F. Kennedy was inaugurated as the 35th President of the United States, and ended on November 22, 1963, upon his assassination and death, a span of 7003103600000000000♠2 years, 306 days. A Democrat, he took office following the 1960 presidential election, in which he narrowly defeated Richard Nixon. He was succeeded by Vice President Lyndon B. Johnson, who served out the remaining 7002425000000000000♠1 year, 59 days of Kennedy's term, and was elected to the presidency in his own right in 1964. This timeline begins on January 2, 1960, the date when then U.S. Senator Kennedy announced his intention to run for the Democratic Party presidential nomination, and concludes on November 25, 1963, when the president was buried. Kennedy was the first Roman Catholic as well as the first person born in the 20th century to be elected president. [a] Additionally, he is the youngest individual ever elected to the office. [b] He was also the eighth (and most recent) president to die in office and the fourth one to be assassinated. His time in office was marked by Cold War tensions with the Soviet Union and Cuba. In Cuba, a failed attempt was made in April 1961 at the Bay of Pigs to overthrow the government of Fidel Castro. In October 1962, the Kennedy administration learned that Soviet ballistic missiles had been deployed in Cuba; the resulting period of unease, termed the Cuban Missile Crisis, is seen by many historians as the closest the human race has ever come to nuclear war between nuclear-armed belligerents. Ultimately, the United States and the Soviet Union came to an agreement to end the crisis, and the Soviets withdrew the missiles. To contain Communist expansion in Asia, Kennedy increased the number of American military advisers in South Vietnam by a factor of 18 over his predecessor, Dwight D. Eisenhower; a further escalation of the American role in the Vietnam War would take place after Kennedy's death. January 2 – Senator John Fitzgerald Kennedy of Massachusetts officially announces his intention to run for the Presidency of the United States. Other major candidates for the 1960 Democratic presidential nomination are: Governor Pat Brown of California, Senator Stuart Symington of Missouri, Senator Lyndon B. Johnson of Texas, former Illinois Governor Adlai Stevenson, Senator Wayne Morse of Oregon, and Senator Hubert Humphrey of Minnesota. March 8 – Kennedy wins the New Hampshire primary, receiving 88% of the vote. This would be the first of 10 primary victories for the Massachusetts Senator. May 4 – Senators Kennedy and Humphrey hold a televised debate in West Virginia, prior to that state's primary. Kennedy outperforms Humphrey. May 10 – Kennedy wins the West Virginia primary, receiving 61% of the vote, and afterward, Humphrey ends his presidential campaign. West Virginia shows that Kennedy, a Catholic, could win in a heavily Protestant state. July 2 - Former President Harry S Truman goes on television to question whether Kennedy is qualified to be President, saying that he was too young and inexperienced to be president. July 4 - Senator Kennedy responds to Truman's criticism. July 15 – John F. Kennedy is officially nominated as the Democratic Party's presidential candidate at the Democratic Convention, held in the Los Angeles Memorial Sports Arena in Los Angeles, California. Senator Lyndon B. Johnson of Texas is nominated for Vice President. Kennedy was the first senator since 1920 to be nominated for the presidency by either the Democrats or the Republicans. September 12 – Senator Kennedy delivers a campaign speech in which he strongly reaffirms his support for separation of church and state, which successfully cooled tensions surrounding his Catholicism. September 26: Senator Kennedy and Vice President Nixon participate in the first television presidential debate. September 26 – Senator Kennedy and Vice President Richard Nixon participate in the first televised presidential debate. The debate is broadcast from the studios of WBBM in Chicago. The moderator was Howard K. Smith of CBS News. October 7 – Kennedy and Nixon participate in the second presidential debate, held in Washington, D.C.; NBC journalist Frank McGee moderates. October 13 – Senator Kennedy and Vice President Nixon debate each other for the third time; former Face the Nation anchor Bill Shadel moderates. Kennedy participates from a New York studio, while Nixon participates from a Los Angeles studio. October 21 – Kennedy and Nixon participate in the fourth and final presidential debate in New York; ABC News journalist Quincy Howe moderates. November 8 – The 1960 presidential election is held, the first to have both candidates born in the 20th century, and the first in which the two most recently admitted states, Alaska (January 3, 1959) and Hawaii (August 21, 1959), participated. November 9 – Republican presidential candidate Richard Nixon concedes the presidency to Kennedy. Kennedy's official popular vote margin is 0.1% (112,827 votes) and his electoral margin is 84 electoral votes. Nixon won more states, 26 to 22. The electoral result proves to be the closest since the 1916 presidential election. The election of Kennedy and Johnson as President and Vice President was the last time until the 2008 election of Barack Obama and Joe Biden that two incumbent senators were elected on the same ticket. November 25 – John Fitzgerald Kennedy Jr., President-elect and Mrs. Kennedy's second child, is born at Georgetown University Hospital. December 6 – President-elect Kennedy meets with President Dwight Eisenhower at the White House to discuss the presidential transition. December 11 - President-elect Kennedy survives an assassination attempt by anti-Catholic bigot Richard Paul Pavlick, who had plotted to assassinate him via suicide car bombing. January 20: John F. Kennedy is inaugurated as the 35th President of the United States. January 20 – Kennedy's presidency begins with his inauguration at the United States Capitol in Washington, D.C. Kennedy is sworn in by Chief Justice Earl Warren and delivers a widely praised inaugural address, asking Americans to "ask not what your country can do for you, but what you can do for your country" and for the people of the world to "ask not what America will do for you, but what together we can do for the freedom of man". He is congratulated by Soviet Premier Nikita Khrushchev. Kennedy also formally nominates his cabinet and attends the inaugural balls. January 21:The Cabinet is sworn in by Chief Justice Earl Warren. January 21 – Kennedy meets with former President Harry S. Truman and issues Executive Order 10914 directing a doubling of the quantity of surplus food distributed to needy families. Kennedy also attends a meeting at the Democratic National Committee and hosts the swearing-in of his cabinet. January 22 – Kennedy meets with the poet Robert Frost. President Kennedy, Ted Kennedy, and Paul B. Fay attend mass at the Holy Trinity Catholic Church in Washington, D.C. Kennedy establishes the three-member Government Ethics Committee. Kennedy appoints Hickman Price, Jr. and Roland Burnstan as Assistant Commerce Secretaries. January 23 – Kennedy meets with several defense, foreign policy, and intelligence advisers, including Defense Secretary Robert McNamara, Secretary of State Dean Rusk, National Security Advisor McGeorge Bundy, CIA Director Allen Dulles, and Chairman of the Joint Chiefs Lyman Lemnitzer. Kennedy nominates Frank Burton Ellis for a federal judgeship on the United States District Court for the Eastern District of Louisiana. January 24 – Kennedy meets with then-former Congressman (later Senator) George McGovern of South Dakota. He also meets with Democratic legislative leaders, and receives a tour of the shelter areas of the White House from Naval Aide, Cmdr. Tazewell Shepard. He is presented plans for what would become the Food for Peace program and designates McGovern Director. January 25 – Kennedy holds his first regular live televised press conference in the State Department Auditorium. He announces the release of two surviving USAF crewman by the Soviet Union after being captured when their RB-47 Stratojet was shot down on July 1, 1960. January 30 – Kennedy delivers his first State of the Union address to a Joint session of the United States Congress. February 1 – President Kennedy holds his second presidential news conference; he announces the establishment of five pilot food stamp distribution projects. He later meets with economic and budget advisers. President Kennedy holds the first meeting of the National Security Council and sends a letter to Defense Secretary McNamara marking the scheduled launch of the USS Sam Houston (SSBN-609) the next day. February 2 – President Kennedy meets with NATO Supreme Allied Commander Lauris Norstad, Joint Chiefs Chairman Lyman Lemnitzer, and later with his cabinet. Kennedy appoints Burke Marshall as Assistant Attorney General for Civil Rights, David K. E. Bruce as Ambassador to the United Kingdom. Kennedy telegrams the mayors of 297 cities urging an increase in urban renewal activities. February 3 – President Kennedy meets with Ambassador to Laos Winthrop G. Brown. Kennedy and Paul B. Fay attend the movie Spartacus at the Warner Theater. After meeting with Health, Education, and Welfare Secretary Abraham A. Ribicoff, Kennedy orders money and surplus food totalling $4 million for Cuban refugees in fiscal year 1961. March 1 – Emphasizing the theme of public service in his inaugural address, President Kennedy issues Executive Order 10924, establishing the Peace Corps on a "temporary pilot basis". Kennedy also sends to Congress a message requesting authorization of the Peace Corps as a permanent organization. President Kennedy holds his fifth presidential news conference. President Kennedy and Eleanor Roosevelt make a tape recording promoting the Youth Peace Corps. President Kennedy records a message for the American Red Cross. President Kennedy signs into law a joint resolution (H.J. Res. 155) to commemorate the 100th anniversary of the first inauguration of Abraham Lincoln on March 4, 1861 (PL87-1). March 4 – President Kennedy meets with Council of Economic Advisers Chairman Walter Heller and later appoints Sargent Shriver to head the Peace Corps. He also dines at the home of his brother, Attorney General Robert F. Kennedy and meets with Ambassador to the United Kingdom David K. E. Bruce. March 13 – President Kennedy proposes the Alliance for Progress. March 24 – President Kennedy signs a commission restoring the five star rank general of the army position to former President Eisenhower. April 1 – Kennedy meets with Secretary of State Dean Rusk. Kennedy also declares parts of eastern Iowa flooded by the Cedar River to be a major disaster area. April 2 – Kennedy meets with journalists Albert Merriman Smith and Marvin Arrowsmith. The First Family view the film All in a Night's Work. April 12 – The Soviet Union's launch of Yuri Gagarin into low Earth orbit aboard Vostok 1 marks the first time a human being is launched into outer space. Kennedy messages Soviet Premier Nikita Khrushchev, congratulating him on the successful launch of Vostok 1. April 17 – Continuing a concept originating in the Eisenhower Administration, Kennedy orders the invasion of Cuba in an unsuccessful attempt to overthrow the communist regime. April 19 – The invasion of Cuba fails and results in a Cuban revolutionary victory. Kennedy's administration is severely embarrassed, so much so that Kennedy stated he wanted to "splinter the CIA into a thousand pieces and scatter it into the wind." May 25: Kennedy lays out the goal to "land a man on the Moon and return him safely to the Earth". May 2 – The Freedom 7 spacecraft is readied for a launch attempt which would have resulted in the first American human spaceflight; it is canceled due to poor weather and rescheduled for May 5. May 5 – Alan Shepard is launched on Freedom 7 on a sub-orbital spaceflight aboard a Mercury-Redstone rocket, and becomes the first American in outer space. The flight lasts 15 minutes 22 seconds, and reaches an apogee of 187.42 kilometres (116.46 mi), and a maximum speed of 8,277 kilometres per hour (5,143 mph) (Mach 6.94). May 8 – Kennedy meets with Alan Shepard at the White House, to congratulate him on becoming the first American in space. He awards him the NASA Distinguished Service Medal in a ceremony on the White House lawn. The six other Mercury Seven astronauts attend the ceremony, the next of which, Gus Grissom, would launch into space less than three months later. May 16–18 – Kennedy makes the first international trip of his presidency, travelling to Ottawa, Ontario, Canada, for a state visit. There he meets with Canadian Governor General Georges Vanier and Prime Minister John Diefenbaker. On May 17, he addresses the Canadian parliament. May 25 – In an address to a Joint session of the United States Congress, Kennedy announces full presidential support for the goal to "commit...before this decade is out, to landing a man on the Moon and returning him safely to the Earth" and urges Congress to appropriate the necessary funds, eventually consuming the largest financial expenditure of any nation in peacetime. Though Kennedy had initially been convinced that NASA should attempt a manned mission to Mars, NASA Associate Administrator Robert Seamans spent three days and nights working, ultimately successfully, to convince him otherwise. May 31 – June 5 – Kennedy makes the second international trip of his presidency. May 31 – June 3 – Addresses North Atlantic Council, and meets with French President Charles de Gaulle in Paris, France. June 3–4 – Meets with Austrian President Adolf Schärf and has a summit meeting with Soviet Premier Nikita Khrushchev. June 4–5 – Visits with British Queen Elizabeth II and Prime Minister Harold Macmillan in London, England. September 25 – Address before the United Nations General Assembly (JFK's first of two) announcing the US intention to "challenge the Soviet Union, not to an arms race, but to a peace race". December 16–17 – Kennedy makes the third international trip of his presidency. December 16–17 – Meets with Venezuelan President Rómulo Betancourt in Caracas, Venezuela. December 17 – Meets with Colombian President Alberto Lleras Camargo in Bogota, Colombia. December 21–22 – Kennedy makes the fourth international trip of his presidency, travelling to Hamilton, Bermuda, where he meets with British Prime Minister Harold Macmillan. February 20: John Glenn, aboard the Friendship 7 space capsule, becomes the first American to orbit the Earth. January 11 – Kennedy delivers his second State of the Union address. February 12 – As Commander-in-chief, Kennedy commutes the military death sentence of seaman Jimmie Henderson to life imprisonment, marking the last time in the 20th century that an American president was faced with such a decision (As of 28 July 2008[update], the most recent such decision was when President George W. Bush decided to deny clemency to Private Ronald A. Gray). February 20 – John Glenn, aboard the space capsule Friendship 7, is launched into an orbital spaceflight by a Mercury-Atlas 6 rocket and becomes the first American to orbit the Earth. March 22 – Kennedy signs into law HR5143 (Pub.L. 87–423), abolishing the mandatory death penalty for first degree murder in the District of Columbia, the only remaining jurisdiction in the United States with a mandatory death sentence for first degree murder, replacing it with life imprisonment with parole if the jury could not decide between life imprisonment and the death penalty, or if the jury chose life imprisonment by a unanimous vote. The death penalty in the District of Columbia has not been applied since 1957, and has now been abolished. September 12: President Kennedy visits Rice University to deliver a speech on the nation's space program. December 12: President and Mrs. Kennedy standing next to the White House Christmas tree, located in the Entrance Hall. May 1 – Kennedy signs the Educational Television Facilities Act into law, marking the first time Congress provided major federal aid to public broadcasting. May 19 – Marilyn Monroe sings Happy Birthday, Mr. President to President Kennedy in Madison Square Garden as part of the President's 45th birthday celebrations (the birthday itself was on May 29). June 29 – July 1 – Kennedy makes the fifth international trip of his presidency, travelling to Mexico City, Mexico, for a state visit. There he meets with Mexican President Adolfo López Mateos. July 4 – Kennedy delivered an address at Independence Hall, Philadelphia, Pennsylvania, in which he spoke of the new movement toward interdependence that is transforming the world, and noting that the spirit of that new effort is the same spirit which gave birth to the American Constitution. July 10 – President Kennedy attends the All Star baseball game at D.C. Stadium, and throws out the first pitch. September 12 – Kennedy delivers a speech at Rice University on the subject of the nation's plans to land humans on the Moon. Kennedy announces his continued support for increased space expenditures, saying "we choose to go to the moon in this decade and do the other things, not because they are easy, but because they are hard." October 22 – In a televised address, Kennedy announces the October 14 discovery of Soviet missiles in Cuba, making public the Cuban missile crisis. Kennedy also announces a naval "quarantine on all offensive military equipment" to that country. November 6 – The 1962 elections are held. The Democrats lose seats in the House to Republicans, but maintain their majority; they increase their majority in the Senate. Kennedy's brother Ted wins a special election in Massachusetts to represent the state as junior senator, in the seat his brother had held prior to his election as president. November 22 – Kennedy is presented with the Laetare Medal by Rev. Theodore Hesburgh, the president of the University of Notre Dame. The Medal, annually awarded by Notre Dame, is considered the highest award for American Catholics. Kennedy was presented with the award in the Oval Office, by Fr. Hesburgh, who was also a member of the United States Commission on Civil Rights, and the Rev. Edmund P. Joyce, the university's executive vice president. December 12 – President Kennedy meets with President Jorge Alessandri of the Republic of Chile, have a working meeting to discuss the Alliance for Progress. December 18–21 – Kennedy makes the sixth international trip of his presidency, travelling to Nassau, The Bahamas, where he confers with British Prime Minister Harold Macmillan and concludes an agreement on nuclear defense systems. December 25 – President and Mrs. Kennedy attend mass at St. Ann's Church in Palm Beach, Florida. The Kennedys later hold a party for members of the Secret Service and their families. January 14: President Kennedy delivers his third State of the Union address. January 10 – Kennedy meets with President-elect Juan Bosch of the Dominican Republic. January 11 – Kennedy meets with Labor Secretary W. Willard Wirtz and AFL-CIO President George Meany. January 12 – Kennedy announces the appointment of David L. Lawrence as Chairman of the President's Committee on Equal Opportunity in Housing. Kennedy also appoints Phil N. Bornstein as Federal Housing Commissioner. January 14 – Kennedy delivers his third (and final) State of the Union address. January 31 - JFK selects Franklin D. Roosevelt, Jr. for United States Undersecretary of Commerce. RFK denies government pressure is preventing Teamster union officials from getting their required bonds. JFK sends a message to Capitol Hill for the government to pay the cotton trade to increase sales of domestic cotton alongside the government paying the feed grain and dairy farmers to not produce. February 10 – The President and the First Lady attend the play Beyond the Fringe in New York City. February 20 – In a letter to Attorney General Robert F. Kennedy, President Kennedy denies clemency to Victor Feguer, a convicted murderer. March 15 – Victor Feguer is executed after Kennedy's February 20 denial of clemency. The execution marks the last federal execution until the execution of Timothy McVeigh on June 11, 2001. March 18–20 – Kennedy makes the seventh international trip of his presidency, travelling to San José, Costa Rica, where he attends the Conference of Presidents of the Central American Republics. June 26: President Kennedy delivers his now-famous Ich bin ein Berliner speech. June 10 – Kennedy delivers the commencement address at American University in Washington, D.C.
June 11 – Kennedy delivers the Civil Rights Address in the aftermath of the Birmingham campaign and recent Stand in the Schoolhouse Door incident and further calls for legislation to enact a civil rights bill. June 23 – July 2 – Kennedy makes the eighth international trip of his presidency. June 23–25 – Visits Cologne, Frankfurt, and Wiesbaden, West Germany; also holds meetings with West German Chancellor Konrad Adenauer and other officials. June 26 – Visits West Berlin and delivers his now-famous Ich bin ein Berliner speech advocating representative democracy and capitalism as a replacement for communist regimes around the world. June 26–29 – Visits Dublin, Wexford, Cork, Galway, and Limerick, Ireland; also addresses the Irish Parliament. June 29–30 – Travels to the United Kingdom for an informal visit with British Harold Macmillan at his home in West Sussex, England. July 1–2 – Travels to Naples and Rome, Italy, where he meets with Italian President Antonio Segni, and NATO officials. July 2 – Has an audience with the newly elected Pope Paul VI at the Apostolic Palace in Vatican City. July 24 – President Kennedy meets with a group of Boys Nation senators, including future U.S. President Bill Clinton, at the White House. August 7 – Patrick Bouvier Kennedy, President and Mrs. Kennedy's third child, is born (five-and-a-half weeks prematurely) at the Otis Air Force Base Hospital in Bourne, Massachusetts. Shortly after birth, he develops symptoms of hyaline membrane disease, now called infant respiratory distress syndrome. August 9 – Patrick Bouvier Kennedy dies at Boston Children's Hospital. August 28 – The March on Washington for Jobs and Freedom occurs in Washington, D.C., culminating in the now-famous "I Have A Dream" speech by Martin Luther King. Estimates of the number of marchers range from 200,000 to 300,000. Dr. Martin Luther King Meets with President Kennedy, along aside other civil rights activists. September 20 – Address before the United Nations General Assembly (JFK's second) stating various specific recommendations to "move the world to a just and lasting peace". September 28 – Dedication of Clair A. Hill Whiskeytown Dam just outside Redding, California in Shasta County. Kennedy touted the reservoir as the largest of the Trinity County Dams" that "could be used to benefit the farms and lands further south"
October 7: President Kennedy signs the Partial Test Ban Treaty, a major milestone in early nuclear disarmament in the Nuclear Age. October 3 – President Kennedy visits Cleburne County, Arkansas, to dedicate the Greers Ferry Dam. This is the last public appearance before he was shot in Dallas. October 7 – President Kennedy signs the Partial Test Ban Treaty, prohibiting all nuclear weapons testing providing an exception for underground nuclear testing only. October 8 – President Kennedy announces an agreement with the Soviet Union to open negotiations for the sale of American wheat. November 22: President Lyndon B. Johnson is sworn in aboard Air Force One, roughly 90 minutes after Kennedy's death. November 14: President Kennedy attends a dedication ceremony at the border of Maryland and Delaware marking the completion of the Northeast Expressway and the Delaware Turnpike, which together form part of Interstate 95 and provided a limited-access route between Baltimore and the approach to the Delaware Memorial Bridge. Both roads were renamed the John F. Kennedy Memorial Highway a month later following his assassination. November 18 – Kennedy traveled to Tampa, Florida. There, he visited the military's Strike Command Headquarters, attended a luncheon at the officer's club, made a speech at the Florida Chamber of Commerce, and another to the United Steelworker's Union. November 21 – President Kennedy asks his economic advisers to prepare the War on Poverty for 1964. Less than two months after the President's assassination, President Johnson introduces the legislation in his first State of the Union address on January 8, 1964, and two of the major pieces of related legislation – the Economic Opportunity Act of 1964 and the Social Security Act of 1965 – are signed into law on August 20, 1964, and July 30, 1965, respectively. November 22 – President Kennedy and Texas Governor John Connally are shot at 12:30 p.m. CST (18:30 UTC) in Dealey Plaza, Dallas, Texas. They are rushed to Parkland Memorial Hospital, where Kennedy is pronounced dead at 1:00 p.m. CST (19:00 UTC). Lee Harvey Oswald is arrested and charged with the murder. Oswald is shot and killed two days later by nightclub owner Jack Ruby. November 22 – Vice President Lyndon B. Johnson succeeds to the Presidency and is sworn in aboard Air Force One. November 23 – Kennedy lies in repose in the White House East Room for a period of 24 hours. At 4:45 pm, President Johnson issues Proclamation 3561, declaring November 25, the day of the funeral service, to be a national day of mourning. November 24 – Kennedy lies in state for a period of 18 hours. NBC broadcasts live uninterrupted coverage of people passing through the Capitol rotunda during the overnight hours. November 25 – Kennedy's funeral service is held. Representatives from over 90 countries attend the ceremony. President Kennedy is laid to rest at Arlington National Cemetery. Upon the request of the now-former First Lady Jacqueline Kennedy on the day before, an eternal flame, inspired by the Tomb of the Unknown Soldier at the Arc de Triomphe in Paris, known later as the John F. Kennedy Eternal Flame, is set up by the United States Army Corps of Engineers, and first lit by Mrs. Kennedy. November 23: Kennedy lies in repose in the East Room of the White House. ^ Four subsequent presidents were born earlier in the century then Kennedy: Lyndon Johnson (1963–1969), on August 27, 1908; Ronald Reagan (1981–1989), on February 6, 1911; Richard Nixon (1969–1974), on January 9, 1913; and Gerald Ford (1974–1977), on July 14, 1913. ^ Although Theodore Roosevelt was younger than Kennedy when he became president in 1901, upon the death of William McKinley, he was older than Kennedy when elected to the presidency in his own right in 1904. ^ "POTUS: Presidents of the United States". Internet Public Library. Retrieved December 18, 2016. ^ John F. Kennedy Presidential Library and Museum. "John F. Kennedy Fast Facts: Announcement as Candidate for President, January 2, 1960". jfklibrary.org. ^ University of Virginia Miller Center of Public Affairs. "Acceptance of the Democratic Party Nomination (July 15, 1960)". millercenter.org. ^ W.H. Lawrence (July 15, 1960). "Johnson is Nominated for Vice President; Kennedy Picks Him to Placate the South". nytimes.com. ^ National Public Radio (December 5, 2007). "Transcript: JFK's Speech on His Religion". npr.org. ^ Public Broadcasting Service American Experience. "Biography: 35. John F. Kennedy". pbs.org. ^ New York Times (September 26, 2011). "Sept. 26, 1960: First Televised Presidential Debate". nytimes.com. ^ Commission on Presidential Debates (2012). "October 7, 1960 Debate Transcript: The Second Kennedy-Nixon Presidential Debate". debates.org. ^ Commission on Presidential Debates (2012). "October 13, 1960 Debate Transcript: The Third Kennedy-Nixon Presidential Debate". debates.org. ^ Commission on Presidential Debates (2012). "October 21, 1960 Debate Transcript: The Fourth Kennedy-Nixon Presidential Debate". debates.org. ^ John F. Kennedy Presidential Library and Museum. "Campaign of 1960". jfklibrary.org. ^ Associated Press; Cornell University (November 9, 1960). "Nixon Talks to Supporters, Virtually Concedes Defeat". cornell.edu. ^ Russell D. Renka; Southeast Missouri State University (March 1, 2010). "The 1960 Kennedy v. Nixon Election". semo.edu. Archived from the original on April 25, 2012. ^ St. Bonaventure University (April 5, 2013). "1960 Election". sbu.edu. Archived from the original on March 4, 2016. ^ "December 1960 Chronology - Eisenhower Presidential Papers - Eisenhower Memorial Commission". Dwight D. Eisenhower Memorial. February 1, 2006. Retrieved January 9, 2010. ^ United States Congress Joint Committee on Inaugural Ceremonies. "Swearing-In Ceremony for President John F. Kennedy Forty-Fourth Inaugural Ceremonies, January 20, 1961". senate.gov. ^ Yale University Law School. "Inaugural Address of John F. Kennedy". yale.edu. ^ Whealan, Ronald E. (October 30, 2005). "January 21, 1961". John F. Kennedy Library. Retrieved January 9, 2010. ^ "Kennedy Signs Ike's 5 Star Commission". Chicago Tribune. March 24, 1961. ^ a b c d e f g h "Travels of President John F. Kennedy". U.S. Department of State Office of the Historian. Retrieved May 18, 2016. ^ "NASA Langley Research Center's Contributions to the Apollo Program". Langley Research Center. November 21, 2004. Retrieved January 10, 2010. Answering President Kennedy's challenge and landing men on the moon by 1969 required the most sudden burst of technological creativity, and the largest commitment of resources ($24 billion), ever made by any nation in peacetime. At its peak, the Apollo program employed 400,000 Americans and required the support of over 20,000 industrial firms and universities. ^ "Robert C. Seamans Jr". Massachusetts Institute of Technology. June 10, 2009. Retrieved January 10, 2010. President Kennedy had been convinced that America needed to send a man to Mars and back before the decade was out. Bob [Seamans] told me the story of working three days and nights trying to put together, clearly and succinctly, the case for the President that we cannot hit that goal, we need to go to the Moon. ^ Riechmann, Deb (2008-07-29). "Bush: Former Army cook's crimes warrant execution". ABC News. Associated Press. Retrieved 2008-07-29. ^ Whealan, Ronald E. (2006-01-19). "Kennedy Legislative Record, Page 2 - Summary of the Three Year Kennedy Record (Legislation)". John F. Kennedy Presidential Library. Retrieved 2009-08-28. ^ "Norton Letter to U.S. Attorney Says Death Penalty Trial That Begins Today Part of Troubling and Futile Pattern". Office of Congresswoman Eleanor Holmes Norton. 2007-01-08. Retrieved 2009-08-28. ^ "The Public Papers of President John F. Kennedy: 1962". Government Printing Office. Retrieved May 18, 2016. ^ "1962 All-Star Game". Baseball Almanac, Inc. Retrieved May 18, 2016. ^ "Presentation of Notre Dame's Laetare Medal to President Kennedy, 1:25PM - John F. Kennedy Presidential Library & Museum". www.jfklibrary.org. ^ Burd, Laurence (January 31, 1963). "Name Son of FDR Top Commerce Aid". Chicago Tribune. ^ "Kennedy Denies Hoffa's Charges Over Bonding". Chicago Tribune. January 31, 1963. ^ Freeburg, Russell (January 31, 1963). "Farm Message To Congress Avoids Detail". Chicago Tribune. ^ J. F. Kennedy (February 20, 1963). "Victor Harry Feguer -- Petition for Commutation of Death Sentence". The Smoking Gun. Archived from the original on July 27, 2003. Retrieved January 9, 2010. I have reviewed your letter of January 21 regarding the application for clemency in behalf of Mr. Feguer. Taking all factors into account, it is my decision that the petition should be and is hereby denied. ^ Altman, Lawrence K. (July 29, 2013). "A Kennedy Baby's Life and Death". The New York Times. Retrieved July 29, 2013. This article incorporates public domain material from the National Archives and Records Administration document "The White House Diary". Booknotes interview with Reeves on President Kennedy: Profile of Power, December 12, 1993. This page was last edited on 17 February 2019, at 03:33 (UTC).